In her dance and performances of the 1960s, Yvonne Rainer famously transformed the performing body -- stripped it of special techniques and star status, traded its costumes and leotards for T-shirts and sneakers, asked it to haul mattresses or recite texts rather than leap or spin. 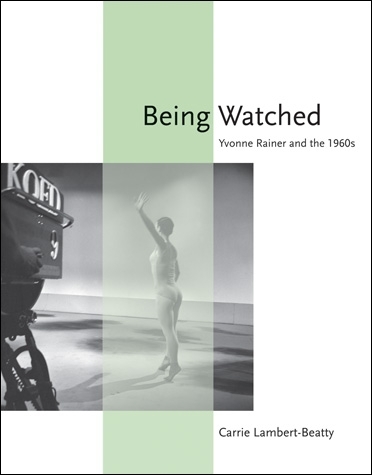 Without discounting these innovations, Carrie Lambert-Beatty argues in Being Watched that the crucial site of Rainer's interventions in the 1960s was less the body of the performer than the eye of the viewer -- or rather, the body as offered to the eye. Rainer's art, Lambert-Beatty writes, is structured by a peculiar tension between the body and its display. Through close readings of Rainer's works of the 1960s -- from the often-discussed dance Trio A to lesser-known Vietnam war-era protest dances -- Lambert-Beatty explores how these performances embodied what Rainer called "the seeing difficulty." (As Rainer said: "Dance is hard to see.") Viewed from this perspective, Rainer's work becomes a bridge between key episodes in postwar art. Lambert-Beatty shows how Rainer's art (and related performance work in Happenings, Fluxus, and Judson Dance Theater) connects with the transformation of the subject-object relation in minimalism and with emerging feminist discourse on the political implications of the objectifying gaze. In a spectacle-soaked era, moreover -- when images of war played nightly on the television news -- Rainer's work engaged the habits of viewing formed in mass-media America, linking avant-garde art and the wider culture of the 1960s. Rainer is significant, argues Lambert-Beatty, not only as a choreographer, but as a sculptor of spectatorship.